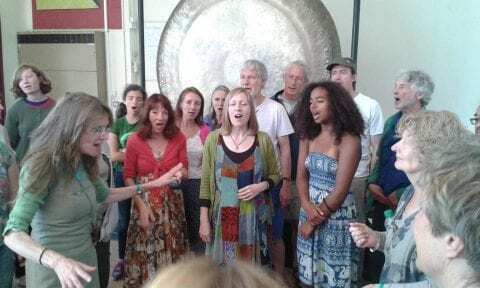 Come and join Carol for a fun filled day of singing – a selection of songs from around the world that will soothe the soul and uplift the spirit. No need to read music- all songs taught by ear. All welcome, from total beginners to seasoned singers. Carol Donaldson runs 3 big community choirs – Wrexham One World Community Choir, Open Voice community Choir in Manchester and Calder Valley Voices. She also runs the Christie Hospital/Maggie’s choir in Manchester – soon to be featured on ITV’s ‘Cold Feet’ (Episodes 5 and 6 – February 11th and 18th) This choir has also featured on Gareth Malone’s show and has appeared on BBC Breakfast . Her NW Stroke choir recently won a national Life After Stroke Award.